Who says you need a separate pot when you cook up a batch of pasta? 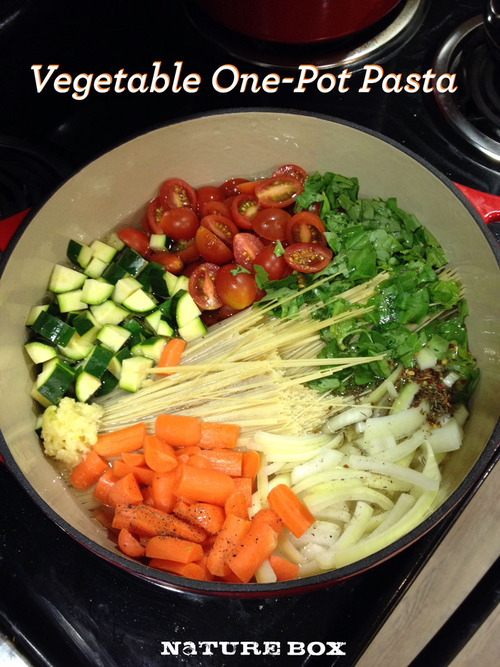 In this recipe, we combined all the yummy ingredients you need for pasta into one big pot. We’re not sure what’s better – that you can use whatever veggie you like or that the whole thing cooks in 15 minutes or less! 1. Combine all ingredients in a pot. Bring to a high boil and then reduce heat to a simmer as you toss it constantly with tongs for about 8 minutes. The stock and tomatoes will reduce down. 2. Do not wait for all of the liquid to evaporate. Taste the pasta as it finishes cooking. When it has softened to your liking remove from the heat. Taste and adjust salt and pepper if needed. Scoop into serving bowls and top with fresh cheese and additional basil.